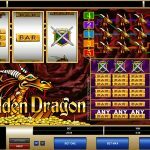 A vast amount of shiny golden coins and gold BAR symbols are the first things that pop up when you open Golden Dragon video slot game from Microgaming. If you are a fan of classic slots then Microgaming has the best ones for sure. As the name itself suggests this game is all about the giant monster sitting on a pile of gold somewhere deep in a cave. Dive deep and slay all the treasure from the dragon in this entertaining game. Everything you need in this slot is in front of you. There is no need to switch to other screen to see the pay table or the winning combinations, another thing that makes this game more attractive. 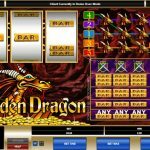 Golden Dragon is a simple classic video slot game. This means there are no complicated features here and the focus is on the game itself. 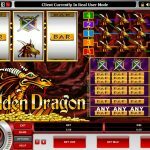 The dragon symbol is the wild and it is the only special symbol in this online slot. Its main function is to substitute for all the other symbols in order to create a winning combination. Another great thing in this game is that the wild combinations can be very lucrative as well; it all depends on which pay line they land. In order to win more we would advise you to play with as many coins as you can afford, of course depending on your bankroll. Playing Golden Dragon from Microgaming is as simple as it can be. In front of us we have a classic slot with lots to offer. What attracted us the most were the insinuations of gold. It can be seen everywhere on the screen, and we can just hope it will eventually end up in our hands. Another great example of a classic slot game would be Gold Coast a 3 reel slot by MicroGaming.